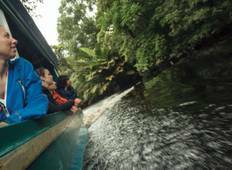 Find a Christmas & New Year trip that explores Tortuguero National Park. There are 28 tours to choose from, that range in length from 3 days up to 18 days. The most popular month for these tours is July, which has the most tour departures. "My Kayaking adventure was a 5 star overall. We had a fabulous guide who knew his..."
"It's not so good itinerary as it looks at first. First and last days are nothing...."
"For a budget tour, everything went really well. 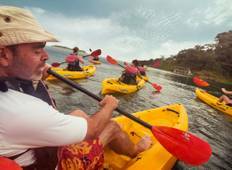 We especially loved the activities,..."
"The Best of Costa Rica tour intention is great and to experience upper north east..."
"A big thank you to Green World Adventures. My family and I did a vacation in Costa..."
"It was a great experience! We have seen a lot of wildlife by boat and hiking! During..."
"Great tour. Good accommodation and transport. A good mix of activities in the tour...."
"Meed better hotels for a more comfortable stay afrer returning from the tiring tour"
"Six of us from Australia, Scotland and Kenya have just been on a private tour organised..."